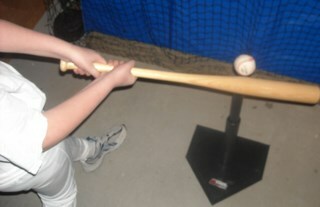 Baseball Hitting Drills are a great way to practice hitting fundamentals through repitition. Additionally, they are an outstanding way to improve hand-eye coordination. On this page, I have included a few hitting drills that parents and coaches can use with their kids or team to instill the muscle memory required to incorporate proper hitting mechanics into a players baseball swing. Players will improve their hitting power, batting average and hit more line-drives (instead of easy-out pop-ups! )as a result of these baseball hitting drills. Will cover 2 different drills in this section. Need to review baseball hitting fundamentals before using these drills? I know hitting off a tee sounds like the days of tee-ball. However, even professional baseball players continue to use the "tee" to stay sharp in both mechanics and directional hitting. I'll explain each in detail here. 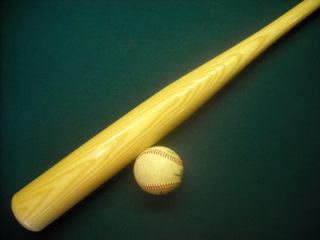 You will need some basic equipment to use this drill like baseball bat (appropriate size for player), baseballs, hitting tee, and hitting net to get the most out of this drill. I recommend the following baseball equipment site to get the best variety and quality of equipment at great prices. 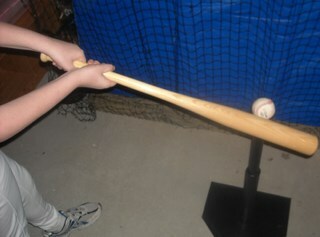 Click here and get 10% off all baseball training equipment aids purchased in 2011, use code AID10. As we cover each drill, I'll explain how we accomplish each desired result. This is simply practicing our routine hitting approach. The best hitters hit the baseball where it is pitched. Let me explain. Inside pitches are pulled, outside pitches are hit to the opposite field and down the middle of the plate pitches are hit up the middle. This drill is highly effective in developing and maintaing the appropriate muscle memory to achieve this. Why do we "go with the pitch"? To hit the ball harder and more effectively (increased power and higher average). Balls pitched to the inside part of the plate are typically pulled by the batter when they are hitting away. This is also called going with the pitch. Using a hitting tee, position yourself into your normal hitting approach. 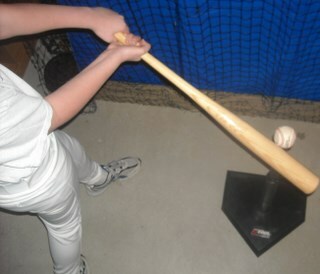 Position the tee a little closer to your body and more out front of the hitter (this simulates where the batter will typically hit the ball when pulling an inside pitch). Simply, take your normal swing and ensure you get your bathead out in front of the plate. This results in pulling the baseball. This is a great way to use baseball hitting drills to improve this technique. A baseball pitched right down the middle of the plate is primed to be hit right back up the middle (right back at the pitcher). Position the hitting tee for a pitch right down the middle of the plate. 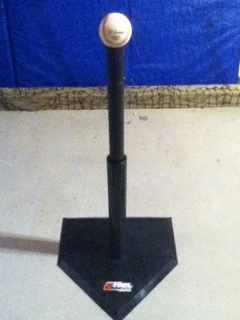 A regular practice tee will have a home plate with the tube holding the ball right on the center of the plate. Just move the position of the tee up slightly (a couple of inches) in front of the normal position of home plate. This will place the position of the ball slightly out front of the middle of the plate (right where we want to hit the ball). 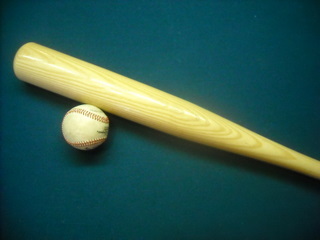 Swing as normal (leading with your hands and knob of the bat as discussed in the hitting tips page). Contact should be made with the ball hitting the barrel of the bat as the bat is positioned parallel with the front of the plate (see diagrams). This will result in the ball being hit right up the middle. This is a great way to use baseball hitting drills to improve this technique. Balls pitched to the outside part of the plate are typically hit to the opposite field by the batter when they are hitting away. This is part of the "going with the pitch" hitting approach. Using a hitting tee, position yourself into your normal hitting approach. Position the tee a little further from your body (to simulate an outside pitch) and slightly behind the center of the plate (this simulates where the batter will typically hit the ball when hitting an outside pitch to the opposite field). Simply, take your normal swing and ensure your bathead is slightly behind your hands. 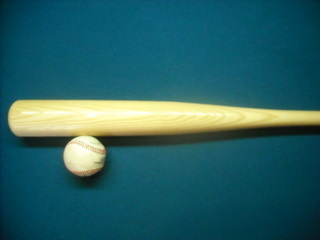 This results in hitting the baseball to the opposite field. Repeat frequently to build the muscle memory required in performing this when facing live pitching. This is a great way to use baseball hitting drills to improve this technique. You can also purchase practice tee's with several hitting positions to place the ball appropriately to accomplish these exercises. Train with the right equipment to get the best results!